You might think that carpet cleaning companies only clean carpets, but you’d be mistaken! At least for us over at Kingwood Carpet Cleaning Pros, cleaning upholstery is no problem! Upholstery cleaning is second nature to us, just like carpet cleaning, so don’t hesitate to give us a call for any and all of your upholstery cleaning needs. Upholstery cleaning can mean many different things. You most likely have a lot of upholstered furniture in your home, from chair cushions, to chairs, to couches, to ottomans, footstools, foot rests, and even your curtains and headboards. Upholstered furniture is more a part of your home than you think, and it probably gets more dirty than you realize. 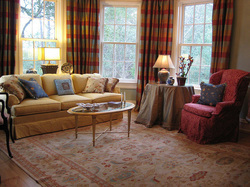 Your couches and chairs in your living room or bedroom are probably made up of upholstered materials and fabric. In order to wash them, you need to fully remove the covers, which is a complete hassle. Getting the covers off for the couch and all of the individual cushions is a nightmare, and they can take a long time to dry. For bigger couches, the cover might not even fit in your standard sized washer or dryer. Getting these items dry cleaned will not only take a few days, but will also be very expensive. Instead, have our pros over at Kingwood Carpet Cleaning come by to clean your upholstery for you. We will take care of removing all of the cushions and can even clean your upholstered furniture on the spot, without having to remove them at all. Sound simple? Not quite! Before you attempt to clean your upholstery from any spots and stains on your own, think about this: when you wet your upholstery, it might seep down into the actual cushioning. If that happens, mold and mildew can start to grow because it will seep down into the cushioning and won’t have any air to breathe. We know how to clean your upholstery without getting it so wet that you run the risk of getting mold or mildew growth underneath the upholstery. We have all of the tools and knowledge needed to clean all sorts of upholstery, no matter what the fabric might be. Some might be denim, cotton, linen, or a silk or polyester mix. Because they are all made of different materials, they need to be treated as such. Our Kingwood pros know how to handle all sorts of materials so that your fabric will not be permanently damaged. Upholstery, like carpets, is expensive! We want it to last as long as possible, and know that one of the best ways to do that is to have it properly, and professionally, cleaned. Don’t risk doing even more damage to your carpets by doing it yourself- instead, have us to all of the dirty work for you! Your couches and chairs get dirty from even just sitting on them, as dirt from your clothes can rub off onto the fabric. You want your living room to look nice and clean, and having dirty or dark spots on your nice upholstery will ruin your aesthetic. You can visit our Office from Eastgate, Texas through a 23 minutes car ride.